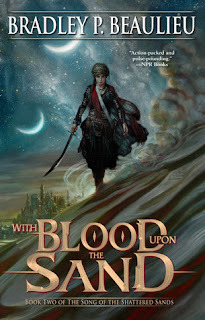 With Blood Upon the Sand is the second full length novel in Bradley P. Beaulieu’s “The Song of the Shattered Sands” series. I was very impressed by the first entry in the series, and the collection of short stories which came out shortly afterwards and served as a prequel. So my hopes were high going into this one – and, not to give the game away, I think it came out rather well. We’re back in the shifting sands around the city of Sharakai for this second novel. It’s still startlingly evocative, carrying a sense of the Arabian Nights, laced with blood and dark magic. The desert is a livening ocean, an uncaring environment happy to swallow the unprepared. There’s some more use of sand skiffs here, using the winds of the desert to drive ships across the dunes for trade and diplomacy. But the desert is still a stark place. It has a sense of mystery to it as well when the moon shines over the sands, there are darker things stirring – blood mages, tribes of resistance fighters, supernatural creatures – all shifting out of the shadows. A seeming bulwark against the eddies of change embodied in the desert, the city of Sharakai has come to life again. Tensions between the forces of the Kings, the mage-lords of the city, and the larger population of the city seem to be growing by the day. It’s an environment that lets Beaulieu explore and expose the causes of that sort of tension – as the authorities crack down on a population by emphasising their power, they drive members of that population into further acts of rebellion, often assisted by third parties. His cycle leads into more extreme actions, and even where most of those on all sides are working with the best of intentions, the results can still be bloody. There’s some interesting thoughts here on inherited grudges, a sense of tensions from injustices going back generations. There’s also a further exploration of the historical atrocities which left the Kings in power in Sharakai, and whether the price paid for a life and future in the past is considered acceptable by any of the participants in the present. All of this provides for a rich, lively, believable setting – a sense of a greater, fascinating world happening around our protagonist. Speaking of protagonist, we’re back with Ceda, the heroine-of-sorts from the last book. She’s now operating within the elite troops of the Kings, and that’ having an impact on her worldview. There’s a focus here, and a sense of living on the edge, which permeates through all of her interactions. At the same time, she’s being forced to understand the situation from the position of forces she’s been struggling against – watching the consequences of guerrilla actions, trying to maintain order on a rapidly sparking powderkeg. If Ceda had few illusions before, they’re now fully lost under the mask which she has to wear. Ceda is, however, a clever woman, and one with a good degree of self-awareness; she struggles against both the external situation – where much of the conflict seems to be wrapped in history – and the internal, as she tries to conquer or control her own demons. If she’s a little quieter now, slightly more calculating, that’s no bad thing – and her meditations on friendship, on the way that those around her can fall into and out of her life, and whether the ties that bind them really do – are both heartbreaking and fascinating. She’s joined by a whole cast of other characters, of course. We can see a bit more of the Twelve Kings, individuals corrupted by power, or using it to do what is necessary, or, perhaps, neither – their agenda is clearer here, but no less byzantine. Then there’s the forces of the tribes, desperate to tear down centuries of oppression; Macide, their erstwhile leader, and his colleagues, are quickly ramping up their game. The narrative wants to ask us what price is too cruel to pay for freedom, and Macide and the rest of the rebels are a piece of the answer. Though they don’t have the same level of screen time as Ceda, these rebels are still an intriguing bunch. The same might be said for Ceda’s new associates in the Kings elite troops – here there are smaller stories to share, likes, dislikes, old loves, older mistakes. There’s a plethora of characters on display here, and most of them end up doing more than a few unpleasant things – but it’s to the credit of their characterisation that they’re never just monsters. Blood magicians, yes. Extremists? Absolutely. Oppressive tyrants? Sure. But each carries around their own story to explain why they’re the hero – and if we only see the edges of that story, still the book makes us feel for them. Sharakai isn’t a place holding tight to black and white morality – but one where everyone may be justified, and also wrong. The characters embody that – complex, flawed, often brittle people, doing what they think is best, and often seeing it end badly, spiral out of control – or both. They are, in that way, real people, and their complexity and their flaws make their struggles both more human and very real. The plot – well, as ever, no spoilers. Ceda is trying to work out how to deal with who she is now, and decide what it is that she wants – be it revolution, catharsis, or – well, anything else. In between her struggles to decide who she is, some of her erstwhile comrades are making sacrifices of their own – sometimes rather literally. There’s black magic here, as well as rather a lot of scheming. There’s riots and duels, dreams of better futures snuffed out by a darker present; there’s murders and abductions, and a feeling of rising tension, of matters coming to a head. It’s asking hard questions, turning to the reader for answers, and getting them to keep turning the pages to see which way things will go next. This is an ambitious sequel, larger in scope than its predecessor – and it pulls it off magnificently. It’s intelligent, well drawn and a lot of fun to read – and so I’d recommend it wholeheartedly. Sorry all. I've got a couple of interesting reviews to write, but due to a failure of our heating system, it's actually too cold to sit and type! Normal service should be resumed by next week. If possible, I'll get a review up on Thursday! 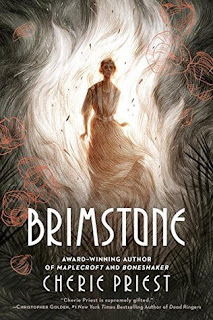 Brimstone is a new standalone novel from Cherie Priest. Priest is commonly known for the steampunk alternate history that she kicked off with “Boneshaker”, but she’s also done a paranormal duology centred on Elizabeth Borden. Brimstone, though, is something else again – a historical novel with paranormal elements as well as a strong character piece. Brimstone is set in Florida, after the close of the First World War. Much of the action is centred on Cassadaga, a small town made famous by its extensive spiritualist community. It has the feeling of a cheerful place, part small-town, part mystic camp. There’s a feeling of sunshine, and of community. Whilst there are always visitors coming and going, drawn by the reputation of the place, the central core of the town remains the same. There’s a sense behind it though – as deeper mysteries are alluded to, and dismissed in the same breath. This is a community of scholars, perhaps, of friendly mediums, of experimental séances – but it’s a laissez-faire one, where rigour and enthusiasm are in competition. That said, the small town atmosphere and overall sunny disposition make Cassadega a haven for the dispossessed and the desperate. It’s that dichotomy which comes alive over the pages, as we’re drawn into the town – whitewashed walls and friendly neighbours are juxtaposed with mystical understanding, and again with the fraught responses of those coming into the town looking for Truth with a capital ‘t’. There’s enough of the world here to make it convincing, broad strokes laid down, with Prohibition bars and art-deco décor playing alongside camps by the railroad and cunning architecture -and the reader can fill in the blanks where required. There’s some more context provided in flashbacks, particularly focused on the war. Here the mood is entirely different, somewhere between sombre and monstrous. Flashes of flame and mud compete with blood and injury, a vision of hell and fire. Priest does well at getting both of these spaces – the trenches and the commune – to feel alive, in very distinct ways. The lick of flame and screaming is drawn in almost dreamlike fashion, but still feels real on the page; the small town, whose secrets are if not dark, at least grey, seems a bustling, cheerful place, familiar, and enjoyable to rediscover for the first time. The two central characters have different viewpoints, largely alternated throughout the text. One is a tailor, a survivor of the war, not entirely unharmed by it. The other wants to be integrated into the Cassadega community, leaving a defined life in order to make something of herself, with a talent she’s not entirely sure of. I enjoyed the latter, a woman not afraid to give her opinion, but also given to throes of doubt, alongside a defining compassion. Her struggles to understand her talent, conveyed through a seemingly literary account, are appropriately painful, her investigations revelatory for both herself and the reader. The other though, the tailor – is something else. There’s a raw pain at work here. A tragedy, a need for love and forgiveness in equal measure. Here is a tortured soul, struggling to renew themselves. Each drop of sweat, of fear, of need, and indeed of love drips off the page, the desperation, the need and its raw humanity making the character into a person. The plot – as ever, I shall try and avoid spoilers. It’s a slow burner of sorts, as one of our characters begins to learn about herself and her abilities, and the other tries to discover whether escalating unusual occurrences are simply accidents, or in some way related to him, or to the world of the dead. The start is quiet, drawing you into the setting, but the tension slowly ratchets over the course of the narrative. By the midpoint, there’s a sense of incipient danger, and of the familiar, friendly places, of the warmth of the sunshine, becoming something darker and more dangerous – a place of fuel and fire. Most of the text is about the protagonists, about their hopes and their fears, and the way they interact with each other as they investigate the troubling occurrences around them. There’s honest misfortune here, and love, calamity and laughter, and even a little Truth. It’s an interesting work of eerie fantasy running side by side with historical reality – and the shape of the protagonists makes the narrative compelling, the investment making the tension, the fear of consequences, real. In short, it’s a story with a slow and steady burn, but one which is worth seeing through. The Heart Of What Was Lost is a novel by Tad Williams, set in the world of his “Osten Ard” novels. 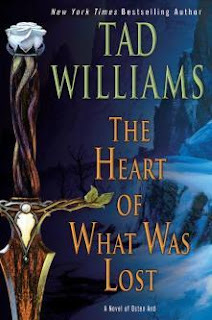 The original Osten Ard sequence was phenomenally popular in the early nineties, and this book marks the first time Williams has returned the world of Osten Ard. The novel takes place in the far north of Osten Ard. Here, a contingent of the heroic army last seen in the previous series fighting off invaders and preventing the end of the world, are chasing down the surviving enemy forces from that battle. The enemy are the “Norns” - a long lived people, with almost supernatural speed and resilience. They’re desperately falling back to a mountain stronghold in the icy north, attempting to ensure both their own survival and that of their beleaguered people. Of course, as the text makes clear, the Norns started this fight in the first place, and they have a penchant for guerrilla warfare, torture and blood sacrifice, so they’re not exactly the plucky underdogs. The army chasing them has a very Norse feel to it –and features a couple of recurring characters. Williams manages to build a believable frozen landscape – watching the Norns flit through the mud, and their more numerous opponents trudge relentlessly after them, you can feel the forest and steam coming off the pages. There’s also some time spent in the Norn city of Nakkiga, an imposing metropolitan nightmare; the Norns also get some time in front of the camera; previously they were really faceless antagonists, dervishes of spiteful destruction. Here they lose a little of that mystique, but make up for that loss with some cultural depth and a sense of their extensive, tragic history. The army of humanity is determined to avenge the attacks on their homes, and they’re led by Isgrimnur. Having lost a son to the Norn, he isn’t overly inclined to give them mercy, and there’s an interesting struggle of character here, as he chases down the Norn, with both sides doing things they’re not proud of. Theres an interesting tension there – both sides internally decrying the others as monsters, indeed as Other – and so justifying their own atrocities, in a dreadful cycle of vengeance. Isgrimnur struggles with this, with whether or not genocide is his only option, or just the easiest tool to hand – and that struggle gives his pieces of the narrative a great sense of tension, a feeling of an army sat a knife edge from going somewhere it can’t return from. The Norn that we see are from several different positions in their social ladder – builders, soldiers and sharp politicians. The main focus is on one of the Builder caste, who is slowly dragged into the political machinations of those around him. Here the character is status conscious, cautious, with an intelligence which sparkles through in dialogue – his growing awareness of the undercurrents of Norn society provides a great deal of insight, and lets us see one of the Norn struggling to make something of themselves, within the constraints of their society. As novels go, this is actually rather short – and much of the plot is focused around the journey. For the army of humanity, this is a stern chase, a slog to fend off a danger before it has a chance to regain strength. For the Norn, it’s a march of survival. There’s some moments of kinetic, well crafted hand to hand combat, and the sketchings of a larger siege, which play on the imagination of the reader – sappers digging in the dark, huge gates assaulted by a similarly massive ram, and so on. But there’s quieter moments – laconic dialogue between squad members slowly being hardened or broken by war, friendships created and destroyed at the toss of a dice. Sometimes the prose felt a little laboured, but as the narrative continued, it became increasingly hard to put down. This is definitely a bridge between the old Osten Ard series and the new one coming out later this year. For old fans, it’ll serve as a welcome return to Osten Ard, albeit a slightly darker version than I recalled, and a solid taster for the new series to come. For new readers, it’s a decent introduction – though you might be better served going through the original series first. The Stars Are Legion is a standalone science fiction novel by Kameron Hurley. 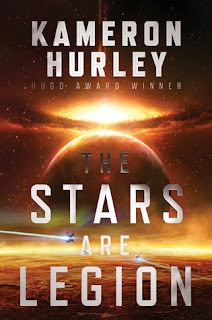 I’ve recently enjoyed Hurley’s “Worldbreaker” series, and thought her “God’s War” sci-fi series was innovative and deserved more attention – so I was quite excited to see what this one was all about before I turned the first page. Hurley brings us a universe of craft which are also worlds. They orbit each other in an enormous swarm, sitting around an energetic star. These world-ships though, seem organic – if they do not live and breathe in the same way as the people inside them, still, they persist. There’s a sense of a larger entity, which is aware of the people within it purely as part of the systems which sustain it. But it’s the sense of the organism, and the feeling of its decline, which sparkles rancidly on the page. If a world can live, it can also die. Systems fail or go into systemic decline. Shielding withers slowly away. The population forgets who and what they are, slowly falling into micro-societies which rarely look anywhere but at themselves. The world-craft have a sense of morbidity, a slowly dripping decay which can be read between every line – and the societies it builds reflect that. They’re insular, some are prone to violence, others simply taken in strange directions. There is, literally, a world on display here, and that its internal social structure (and external wrapping) resembles a Hieronymous Bosch painting is daring and disturbing in equal measure. There’s something of Giger floating about as well – with individuals birthing components required by the ship, with no choice as to what, when and why. In some cases, the results of this process aren’t even required. In moving the typically mechanical into the realm of the organic, there’s space to have a discussion about what exactly defines humanity, and quite what people will do, for themselves and to or with others. 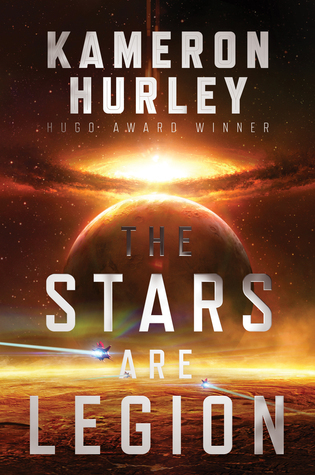 That these fecund, terrifying environs are accepted by those within them as mundane simply highlights their strangeness from a reader perspective – and from that perspective, Hurley has brought out something strange, new, and more than a little horrifying. It may be unclear, but I found myself alternately repulsed and intrigued whilst turning pages, from visceral reaction to further thought, and back again – and the narrative evokes those feelings skilfully, whilst investing you in the journey of the characters within this unusual space. There’s more here that would stand further analysis – about the self-sustaining nature of worlds within the swarm, and what the failure of that nature suggests, or about the presence of metal beneath layers of organism, for example – but suffice to say that as a setting, this feels vivid, quite real, and shockingly imaginative. The characters are, well, different. Victims of circumstance and necessity. Zan is perhaps the most immediate, and the most opaque; she is a woman without a memory, a woman without a past. Or at least not a past she can recall. Her struggles to orient herself in an environment as strange as a world-ship provide opportunities for both sympathy and admiration. Here is an individual who has been mentally broken – but she fights. She fights for every piece of understanding she can muster, dragging truth and lies from those around her, and, if need be, creating her own. In a sense, she creates her own persona – beginning as a tabula rasa, Zan has the chance to decide for herself who she is and what she will be, drawing from the immediate world, and the aspects of the past she can gather from an entire host of unreliable narrators. I’m not sure if she seemed to have the moral certainty to call herself a hero; on the other hand, she certainly has the courage expected of one. There’s strength here, a dogged stubbornness and willingness to struggle, which left me cheering her on, even when her choices or the promises of her past seemed particularly haunting. Zan’s assisted in her journeys, physical and mental, by a relatively small but rich supporting cast. They’ve all got their own problems – from prejudice and cowardice, to physical mutations. Because, rather than in spite of those issues, they seem to look out from the narrative, inviting the reader to consider themselves inside this collective of hurt looking for their mettle. If the world is broken, then so are those within it – some committing atrocities because they think it’s the right thing to do, and others living with the consequences. This is a realm of broken monsters. That said, there’s not much sense of the victim here – whilst some individuals are constrained, they all have a sense of agency, of purpose – a feeling of lives interrupted and brought into focus by the narrative. Whilst some evoke more sympathy than others, each of them feels like they have more than the sides they show the camera. As a result, the underlying cross-currents that come as a consequence of well-drawn, well-developed characters make the whole a gripping, punishing, enchanting read. 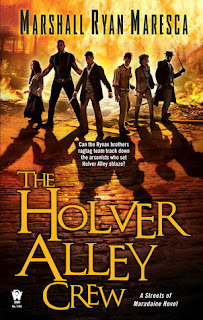 The Holver Alley Crew is the first in a new fantasy series from Marshall Ryan Maresca. It’s set in his ‘Maradaine’ world, which already has a few other series running inside it. Rather than detectives or vigilantes, however, this book is focused on, well, thieves, and a fantasy-style heist. Maradaine is a large, multi-districted city, and it has the energy and diversity on the page to back that up. There’s chemists shops, bars, restaurants, and all of the apparatus of civic life. Up to a point, anyway. We’re not in Maradaine to see the civic buildings or scenic police headquarters this time though – here, we’re in Holver Alley. It is, to be kind about it, not the nicest place in the city. The law doesn’t show up much in Holver, perhaps because it’s been paid not to, and perhaps because it’s indifferent. Instead, there’s a combination of people organising for themselves, and a more criminal element sitting over the top, skimming whatever cream is available. Maresca makes it at once fantastic and familiar – the urban issues faced in the Alley are those common to large conurbations everywhere, but in this case the gangs have crossbows and mages. The alley succeeds in feeling like a neighbourhood – one where everyone knows everyone else. They may not like everyone else, but that’s hardly the point. This is a relatively small, close-knit community, used to being ignored or acted upon by those above it in the social food chain – and that closeness and strength give the book its heart – personified by the links between the characters. Before talking about the characters though, I wanted to mention something else done well in the background – the stratification of society, even in Holver Alley. There’s a sense of the regular people, and those just getting by, dipping in and out of the fringes of the extra-legal. Then there’s the wealthy, whose immense influence allows them to break into communities, to buy influence and wellbeing, to set their own needs above the community – their own goals over the whole. It’s a quiet thread this, running beneath angry dialogue and the occasional brawl within the text, but it’s an important and powerful one. Our protagonists are the Rynax brothers – once professional thieves. Now, after the war that has shaped Maradaine has come to a close, one of them is a settled family man – and the other is suffering from combat strain. Their relationship is close, and friendly, and the effort they put into sustaining the link between them, even when they appear to be poles apart, is obvious. Watching the one interact with his family, his love for his life and his baby is clearly balanced closely with concern for his brother, a man who believes he might lash out with lethal force at any moment. Here is a Rynax everyman, a voice for the reader. The other Rynax, damaged by the war, is something else entirely. He’s tortured by his concern for his brother and their family, and the feeling that he’s only one poorly placed word away from catastrophic levels of violence. There’s the sense of a man on the boil, struggling to drag himself back from the brink. But he’s also quick on his feet, mentally and physically – watching him throw a plan together is breathtaking, and often highly entertaining. Watching him take on groups of antagonists singlehanded is similar – but emotionally leavened by the possibility that this wrath could be turned on his friends. Still, combat shock is being looked at here in the raw, treated sensitively, with a string feeling of the impact it has on both the individuals suffering from it, and those close to them. There’s emotional heft here, rawness and a sense of understanding, which makes, at times, for a heartbreaking read – but at the same time, one which feels genuine. I’d recommend the book for this portrayal alone. The Rynax boys are backed up by a cast of misfits – from street urchins with a bad attitude, to crossbow-snipers with a bad attitude, to carriage drivers and strongmen. As each has a role in the crimes shown off here, each gets their time on the page, and a little more room to shine – but together, in gestalt, they’re a charming, entertaining and prickly mob, whom you’d be happy to buy a round for – with an eye on your wallet. The same can’t really be said for the antagonists. Much of the text, their composition and goals seem mysterious. I’d like to have seen a little more from them, to give them a modicum of the depth and emotional connection that we have with the Rynax boys and their team. On the other hand, the more the enemy present themselves, the more unpleasant they obviously are – and so on that basis, they serve their purpose perfectly well. There’s a few moments where villainy is laid bare – it would be nice to have seen it seeping off the pages. The plot – well, no spoilers, but this is basically a heist novel. The Rynaxes get a team together to investigate why their lives are suddenly in turmoil, and this calls for a certain amount of breaking, entering, and indeed looting. There’s some fantastic planning scenes, as the team pieces together exactly what they’re going to do and when. Then there’s the tension of the job, and this is something which is brought out to perfection – each action is watchmaker-precise, and each failure can lead to a cascade of other failures – watching the team anticipate and deal with these (or not) is agonising and wonderful. 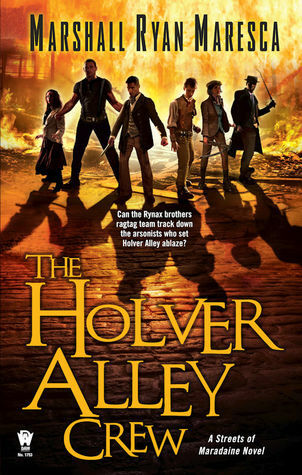 The whole narrative is tightly plotted, and each page makes you want to turn to the next – it’s got fires, knife fights, brawls, daring escapes, explosions, and a lot of heart – and as such, I’m looking forward to seeing what adventures the Holver Alley Crew go onto from here. 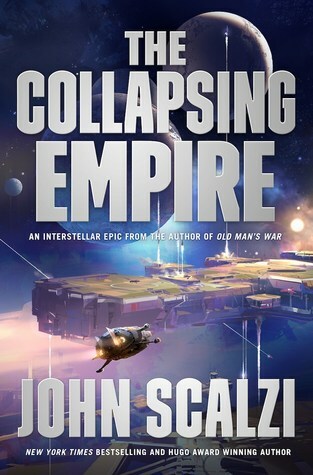 The Collapsing Empire is the first in a new sci-fi series by John Scalzi. I’ve enjoyed Scalzi’s work before – his “Old Man’s War” is seminal, and “Redshirts” was delightfully high concept sci-fi with a bit of bite to it. I came to this latest effort with high expectations – and I’m happy to say that The Collapsing Empire is clever, self aware sci-fi, with some interesting ideas. It’s also rather funny. The setting is a star-spanning collective, the Interdependency. It’s filled with space habitats – from huge stations to small settlements; these and other sealed environs sustain most of humanity. Each series of habitats sits inside a system tied together by the ‘Flow’, a sort of wormhole network – starships can enter the Flow in one system, and be decanted into another after a certain amount of flight time. Quite how the Flow works, and exactly why it ties the systems together, is less well understood. This sprawling network of human settlements is tied together by the habitable world of End, which sits far from the seat of political and trading power that is the imaginatively named ‘Hub’. Scalzi does a great job of bringing End to life – a world populated by noble families with an entrenched sense of privilege, each with a monopoly on particular goods, working alongside guilds of workers to both maintain and expand their monopolies, a microcosm of the social structure of the Interdependency. Both the Nobility and the Guilds run alongside a universal Church, which itself appears to have a fair degree of soft power, and all sit below the “Emperox”. The Emperox is the head of the Church, the top of the heap of the nobles, and, not coincidentally, holds the Guild monopoly on starship and weapons construction. The social constructs make sense, and they act as a vivid, fascinating backdrop for the characters driving the narrative. Speaking of characters – there’s a fair few of these kicking about. Our core focus is on the nobility and the Emperox. The latter is new at her role, having become heir apparent after an unexpected accident removed the preferred candidate. She’s wry, self-deprecating, and clearly intelligent – but very much unprepared, and thrown into a sink-or-swim environment. Watching her deal with the realpolitik climate in which she finds herself, whilst grappling with both larger issues and her own personal struggles makes for compelling reading. Another core character is a member of one of the noble houses of End, also an expert on the physics of the Flow. He’s given a simple but vital mission, and then has to arrange to get away from End in order to achieve it. This means getting out of a war zone, evading powerful interests seeking him for their own ends, and then trying to make a pitch to the most powerful people in the Interdependency. He spends a large portion of the book also being introduced to the harsh realities of the world – occasionally at gunpoint – and discovering that the universe may not work exactly as he hopes it does, as he mixes in with the less noble members of his society. There’s an idealism here, and a sense of straightforward honest which contrasts nicely with the third member of the triad. The third key character is a daughter of the noble houses, and owners representative on a starship. She’s coolly pragmatic, and typically thinks several steps ahead of her adversaries (and people who think they’re her friends). She’s also obviously very clever, or perhaps so sharp she cuts herself. This intelligence is backed up by a strong sense of self, and masked by a diverting amount of profanity. Her dialogue is always profane, but also typically intriguing, and absolutely sizzling with energy. If she’s shown with less of a journey than the other two central characters, it’s because of starting off more aware of who she is, and the roles she’s willing to play. They’re faced by antagonists who are, in fact, rather similar to the protagonists – rich, powerful individuals, prepared to do a great deal to secure or extend their own positions. Here too are intelligences which could drill through steel. They’re as focused and driven as our protagonists, and less villainous than pragmatic, with goals opposed to the protagonists. They are, perhaps, slightly more morally flexible – but it’s possible to look at the opposition to our heroes, and empathise with them. The plot – well, as the title implies, it’s focused on the end of the universe. Or at least, the Interdependency, and the complex web of systems which enable it to function. I don’t want to give anything away, but suffice to say, keeping the Interdependency from collapsing, ameliorating that collapse, or even surviving it, looks to be a rather big job. Watching the quickfire conflicts, largely dialogue rather than combat, is a delight, especially when some of the back and forth is laugh-out-loud funny, and other parts approach some of the big questions of sci-fi – who we are, why society is structured as it is, what we might do with the opportunity and necessity of reshaping the universe and ourselves. There’s some wonderfully tense political scenes, and some moments of spacefaring action that are both heart-stopping to read, and absolutely great fun. In summary then, this is a cracking piece of sci-fi; broad in scope, with interesting characters in a believable world, which asks and quietly tries to answer some hard questions – whilst also providing a story which won’t let you put it down. Skullsworn is a new standalone fantasy novel from Brian Staveley; it’s set in the same universe as his sprawling “Chronicles of the Unhewn Throne” series, though set in a different part of the world. Whilst the Chronicles had a large cast, and was set in the sweep of grand events, Skullsworn is more intimate, but just as sharp – a stiletto in the dark to their predecessor’s flashing blades. This is a novel about Pyrre, a worshipper of the god of death, a woman determined not to fail her Trial and to become Skullsworn – the priests of the god, whose sacrifices tend to align with the demise of those around them. Pyrre is perhaps best described as devout, and difficult. She is committed to becoming a member of her priesthood, and has the necessary lethal skills to do so – but she’s often awkward, struggling to interact with people in a non-mission oriented context. The effect is simultaneously charming and terrifying. Pyrre is, to her credit, aware of her shortcomings in this area, and struggles to be something more of a people person. This flaw goes alongside her speed, focus, and a delightful degree of competence to make her a lot of fun to read about, ash she works her way down the list of individuals she’ll have to arrange meet their demise in order to pass her trial. Some of these are odd, but none more so than the need to put to death someone she loves – itself a concept Pyrre has problems with. As she struggles to work out exactly what she feels, what it means, and what she should do, we also get to see a bit more of her psyche – a less than cheerful family past, a sense of stubborn viciousness, a refusal to surrender – and a previous whirlwind romance that might also have been a duel all play their parts. 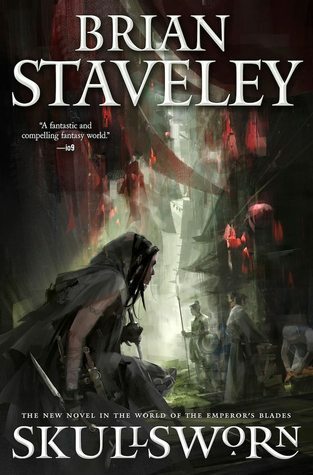 Staveley has done his best here to give us a complex, damaged protagonist, whose talents are held back due to her own compromises, and not because those talents happen to involve killing rather a lot of people. She’s joined for her trial by two adjudicators – one a sprightly people pleaser, as apt to seduce the bellboy as to poison the restaurant; the other a grumbling elder, worn down by life, and struggling to see it as anything but a burden – to himself, or to other people. Both mentor Pyrre, helping her to work out exactly what she wants and how to achieve it – whilst cheerfully admitting that if she fails her trial, they’ll kill her themselves. There’s a thread of black humour running right through the text, a central part of the ties between Pyrre and her judges. There’s a dry tone in here, a means of making the priests of death empathetic and often downright funny – the dialogue sizzles, and raises both wry chuckles and the occasional belly laugh. But this isn’t just a comedy – there’s a vulnerability to Pyrre, a woman seeking the truth of who she is, and an honesty, a truth to her interactions both with the priests who follow here, and the victims she puts down. There’s questions here about what we value, and why, whether any one role is superior to another, how far someone will go to meet their goals – and each page courses with subtext, challenging the reader to unpick it, to look at the complexity of the world and the people that slide quietly off the page. Most of the text takes place in the city where Pyrre was born, before leaving, perhaps somewhat hastily, for other climes. It’s sat on a delta surrounded by a murderous swamp and jungle which stretches out of sight. The swamp is filled with lethal bugs, which lay their eggs in people and cause them to drop dead, lethal fish, which tear people apart, lethal snakes, which bite people and have them turn black and die – and so on. The delta hums with vitality, though – as does the city sat at its heart. Conquered by the Annurian Empire centuries previously, the people hold onto their culture and identity with enthusiasm – and in some cases, with a fanatical hatred. The humidity, the crawling closeness of the city, the danger of the outskirts, all draw a picture of a powder keg, waiting for a careless match to make it go up in flames –or perhaps, in the case of Pyrre, a rather carefully thrown match. In any event, the city is a personality in itself, a thriving, vivid gestalt, which takes in wanderers and citizens, and gives them death and life in equal measure. The plot – well, this is, in many ways, the story of Pyrre. She showed up in the Chronicles, but this book helps us understand who she is, and how she got there. But it’s also a story with conspiracy, with the aforementioned dark humour in plenty, with high (and highly personal) stakes. It also has some absolutely brilliant fight scenes, which have a force and energy that rips them off the page and sets the participants to their fatal dance around you. Oh, and there may even be a bit of romance as well. I was a fan of the Chronicles – of the epic tale they told, of the risks it took, and the new ideas it threw out along the way, but I think that Skullsworn may have exceeded it. This is a warm, funny, character focused novel which is also darkly charming, bloody, and lethal. It was very, very hard to put down, and had an emotional punch to match its high adrenaline moments. If you enjoyed the Chronicles of the Unhewn Throne, this is a more than worthy successor text – and if you’ve never read those, you can pick this up, and know you’re in for a fantastic (if sometimes violent) journey.